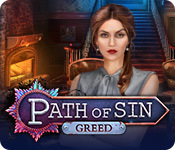 Path of Sin: Greed is rated 4.2 out of 5 by 12. Rated 5 out of 5 by Lucylulu82 from Unique Hidden Object Game This is a bit of a different Hidden Object Game, because it has elements of an adventure game, with twists and turns. It was fun to play detective and gather clues but nothing was too difficult. The graphics were nice and I enjoyed the rain and storm sounds throughout. I always find that to be atmospheric and relaxing. I didn't like the voice actor who plays your partner. His voice got on my nerves and he pauses too much in between sentences, making him sound a bit robotic. There was also a woman with an 'old fashioned' English accent, which didn't suit her character at all. It took me about 7 hours to complete, so not the longest game but still very fun. Rated 5 out of 5 by juliedv5 from Worth the money! Wow, this is a quality game in every aspects : visual, storyline, great amount of locations, of mini-games and HOP. One of the few game without supernatural story (finally!). Only things : the music was a bit repetitive and a bit to much talking for my taste. Rated 5 out of 5 by BooksandGameFan from I'd love a lot more games just like this one! I just finished playing this game and boy what a good time I had. I really, really enjoyed this game and would love to see more made just like it. I loved the scenery, it was a regular every day albeit high end home, garden, boathouse, lighthouse etc. Nothing overly spooky, run down, purple-pink fantasy just regular which I loved. I also loved how we collect evidence to figure out who the suspects are and finally who done it! This could have been done a bit better and used a little more often but overall very well done! My only pet peeve is the guy who is also investigating with me should have been given tasks to do instead of just standing around. He should have worked with me in the game. Come on devs it's 2018 I know you can do this!! The scenes were beautifully done, the hidden object scenes were very nice, the mini-games aren't really my thing but I did manage to do many of the ones in this game, although I'd much rather see more mind type games. ie. number puzzles, suduko, riddles, crosswords or something along those lines. The music was lovely and relaxing, the voice overs were excellent, loved the accents and the sounds of the men's voices. One of the best things for me was the sound of the rain. I find the sound of rain very soothing, almost comforting and they did this so well, the sound changed depending on what location you were in, which is how it is in real life. I loved looking for clues, using the camera and keeping an inventory of the clues, I loved how we could look at them all and come up with suspects. I really hope we get more games just like this! Bravo once again to Artifex Mundi for another fantastic game! I highly recommend this game. Rated 5 out of 5 by Ndwelt from Well done Who Dunnit Perfectly wonderful murder mystery. Even though there is a lot of conversation it is necessary and well done in my opinion. I didn't buy the CE because I thought there was enough going on in the standard version to keep me intrigued. That says a lot for the developers. The only thing I thought was a bit off was the Russian character Alexie's accent. A bit more American than Russian. But what the hey. It is a great game and I can listen to a British accent all day without tiring of it. Enjoy all you "Who Dunnit" fans. Rated 5 out of 5 by skullfun from ~~ A NEW DETECTIVE HOMICIDE QUEST COMES TO BIG FISH!~~ Cordelia Games and Artifex Mundi have collaborated to create an incredibly suspenseful Homicide / adventure game! It was supposed to be a simple suicide case – a quick inspection and lots of boring paperwork. But the more you delve into this secluded island and the twisted family relations of the owners, the more complicated and unclear this case becomes. Join Inspector Abbey as you investigate the suicide of Mark Spector. A security guard employed by Billionaire Henry Bradford to protect his lavish remote Island Estate! As clues unfold you and Inspector Abbey discover more than you bargained for when residents of the island are found dead and your only clue at the start of your investigation is a suspicious suicide note... Along side Inspector Abbey you will investigate several of the island's inhabitants for what appears to be a double murder! Your list of suspects include: Henry Bradford - Billionaire CEO of Bradford IT Company. Edward Bradford - Brother of Henry and CFO of IT Company. Patricia Bradford - Wife of Billionaire Henry Bradford. Alexei Tarkov - Prominent Lawyer for Henry. Richard Jones - Henry Bradford's longtime friend. Grace Anderson - Richard's fiancé Who has an alibi and who's lying? Follow the clues, collect evidence (using your camera & evidence folder) and uncover the truth behind this intriguing story of greed and sin. Even the most seasoned sleuths won't guess who's responsible! I loved every moment of this game from start to finish...and it's a lengthy mystery clocking in at around five (5) hours of gameplay, which is great for a Standard Edition. If you chose the Collector's edition you get another hour for the bonus game. Kudos to Arifex Mundi and Big Fish for this awesome thriller. I highly recommend this to players of every level who enjoy the genre. Cheers! Rated 4 out of 5 by Kirland from "Whodunit?" Loved the storyline and the characters. Graphics were so well done. Beautiful scenes to explore. Sound effects with the storm were excellent and enhanced the suspense of the mystery. Hidden objects and puzzles galore. Nicely done. I really like detective stories. The one thing I did not enjoy was the tedious going back and forth between three or four scenes to finally obtain enough pieces to retreive an item to use. A bit overkill. I do recommend this game. Excellent “whodunit” mystery. Rated 4 out of 5 by pennmom36 from I THINK THEY'RE ON TO SOMETHING HERE As usual, I purchased the Collector's Edition version of this game because I prefer Morphing Objects & Collectibles. I loved the CE collectible Dolls in this game because they Morphed, and even though they were easily spotted within the demo, I figured they would become less discreet as the game progressed. They were slightly less obvious but not by much because they were usually located towards the front of the screen and they morphed much too quickly which really catches your eye. I'm saying this because I like what I'm seeing from this new AM developer, Cordelia, the creators of Kingmaker, and I think with a little tweaking of some of the features they could become a fast-moving train that's hard to stop. I know we tend to complain about the fact that some of the devs are making these games shorter and shorter, but that isn't the case here. This game is incredibly long with 7 Chapters (+Bonus Chapter in the CE version) however, there were times when I just became bored and I felt like all I was doing was going back and forth, not just between 2 scenes, but going 3 scenes back, 3 scenes forward, then 2 back 4 forward, you get the picture. I feel like this would have been a more interesting game if it actually were shortened by a chapter or two instead of adding a couple of filler chapters that had no effect on the outcome or added towards a thickening plot. Here's a recap of my review to help you decide which version, if either, is right for you: You never know what treasures the powerful tides will wash to the shore, but certainly, a dead body is the last thing you'd expect. 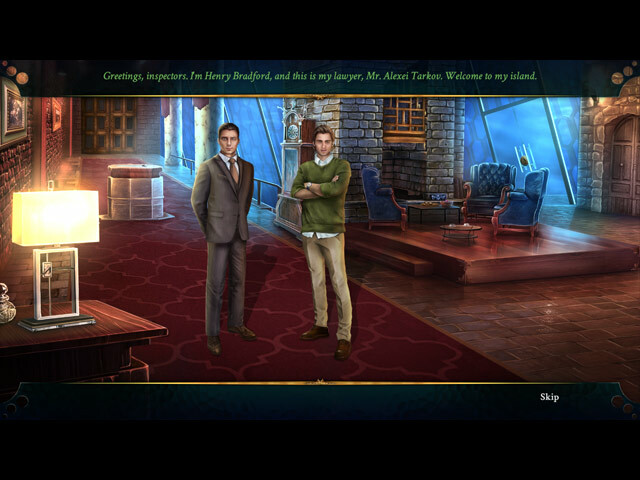 This is a private Island owned by the very rich and famous Bradford brothers, Henry and Edward, and the victim is Mark Spector, the Island's Security Guard. At first glance, his death appears to be the result of an accident, but further investigation points to something much more sinister, murder! The question is, whodunit? We're still in the time-frame era of Gadgets! It seems like gadgets come and go with the tide, every game released has a gadget or two for months and months, and then they just disappear again and then none of the games offers them. I will say that the Instant Camera gadget makes sense in this game tho, you're a Detective investigating a homicide after all. Technically, the forensic team from the Coroner's office would be taking the pictures, and far more pictures would be taken than the handful we take in this game. All the evidence and pictures you collect are stored in an Evidence Folder which offers a mini-game once enough evidence has been collected, to draw conclusions and point to the next lead to follow. The Collector's Edition version has Morphing Sin Bears available in each scene, the problem is, most of them are located towards the front of the scene which makes them appear huge. They also morph fairly quickly which catches your eye so to speak. This is an epic fail, it's just a click feature that has no challenge, therefore no meaning. 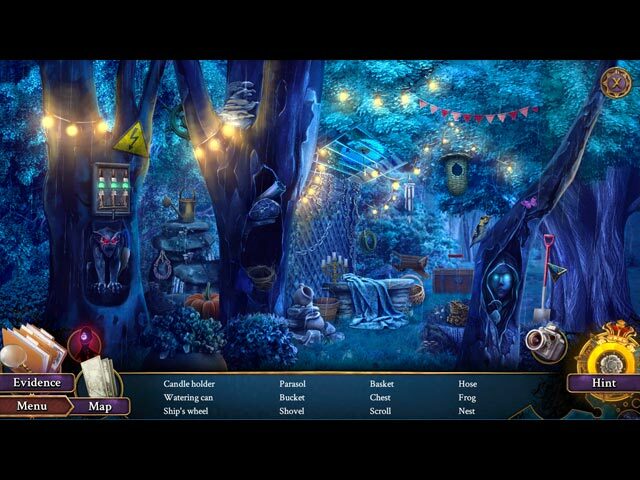 The Hidden Object Scenes are fairly basic and mostly just simple Listed Item finds throughout this rare 7 Chapter offering, although the demo had a very nicely done Interactive, Progressive, Silhouetted Shape puzzle that I really enjoyed. I'm not sure why they didn't continue with that particular style because it was fairly creative. I'm not a huge fan of HO's in these adventure games lately because items are rarely blended into the scene like they used to be, they are just laid out on a desk, the front seat or trunk of a car, across shelves, or sometimes just a corner of the room. They are so predictable you know immediately where the HOS will occur the second you walk into a new room or outdoor scene. I've gotten to the point where I try to find the items without looking at the list to make it more challenging (and I have a pretty good success rate believe it or not) so in all fairness, I'm rarely impressed with Hidden Object Scenes, therefore it's unfair of me to ding this game simply because there is no variety, and honestly, the Listed Item finds are fine, besides, interactions are usually pretty lame anyway. (clicking on a lid to open a jar, or moving an item out of the way isn't much of an added challenge is it?) If the Mini-Games had been more abundant and a little more challenging, I would have given this fantastic whodunit murder mystery a 5-Star rating. 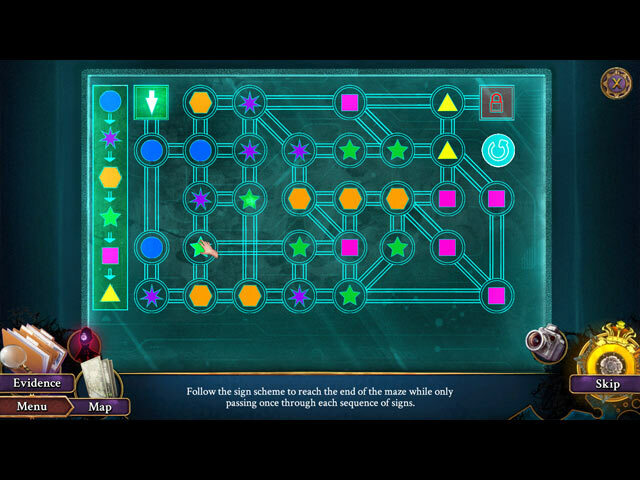 Even the investigation puzzles were rather simplistic and don't allow for mistakes, in other words, if you drag the wrong choice of evidence to the wrong character, it just says that isn't right. I'd much rather make my selections and have a pop-up that says it's wrong, and have to repeat the selections until it's right, isn't that what deductions are all about? I always "test" game options and features like conversation choices, to see if they actually matter, and also to see if my choices affect the outcome of the story, which they rarely do, and unfortunately neither does Path of Sin. If devs would go the extra mile to offer a game that had different outcomes based upon choices made, I'd be willing to pay more...just saying! Below are brief descriptions of some of the games you'll encounter during the demo: 1-Rotate and drag photo fragments to restore the image x2. 2-Follow the sign scheme shown to get from point A to point B. 3-Drag evidence sentence findings to the correct characters. Rotate 2 triangle sections at a time to restore the image. The Collector's Edition version has 6 Wallpapers, 12 Concept Art pictures, 5 Music Soundtracks, 9 Movie Cutscenes, 18 re-playable Mini-Games, 16 re-playable Hidden Object Scenes, 16 Achievements to earn, 28 Collectible Morphing Sin Bears, 7 Main Chapters +Bonus Chapter (The One That Got Away *sequel*) and a built-in Strategy Guide, enjoy this chapter-heavy who-dun-it! Rated 3 out of 5 by riverdiver from Greed, yet no Glory Murder Mysteries are my favourite games. So this game seemed to be right up my alley. A man had fallen off the cliff, my partner and I are called to look into this case on a private island and we soon find out this was not a suicide, but a murder. I loved the graphics, crisp, detailed, especially in the Hidden Objects scenes. Five stars to the game’s mechanics: hint button, the interactive map, all first-class. But: As much as I liked the plot, it didn’t bowl me over. Nothing I have not played before. Asking several people the same questions got really tedious here. Why not do it in different way? Asking one person, then weave in the other interviews in a different way, a mini game, a HO? The case file was helpful, but sorting the evidence was not interesting, a matter of persistence, not deduction. Several actions were out of my understanding. As towards the very end: If you opened a gate and a camping trailer is hurling towards you - would you stay put in the middle of the road or hide behind the walls to the left or the right? Please, please, please: more credibility! Another but: the music was far too repetitive for my taste. The same tune was repeated over and over and over. There could so much more to be done with it. As complete silence for a while, just a single note and more background sounds, variations in tempo and key. My last "but" concerns the items in the HO’s. As much as I liked them, occasionally you got something rather strange, as the „Gift case“ in the Kitchen Cellar. I had to take resort to random clicking - and found a barrel with a gear on top? In my opinion this game is a few steps away from being a really good game. I still recommend it!